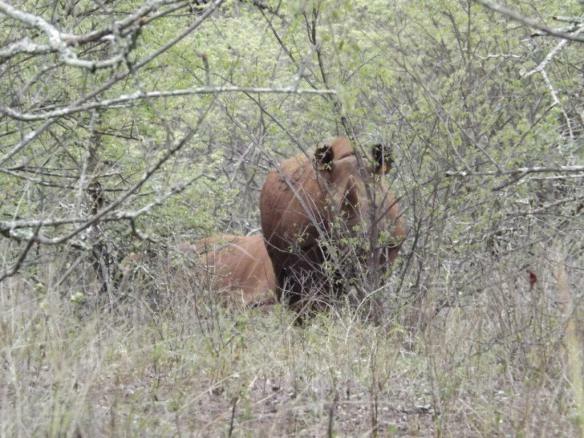 Here, reblogged from the International Rhino Foundation,is an update on the trio. It is now over nine months since our last two black rhino poaching orphans, BeBrave and Long Playing, were returned to their natural home. The rainy season has started well into October and the resulting flush of new leaves is ensuring that our little rhinos are growing outwards as well as upwards. Settling into life in the wild took our two hand raised orphans a little time to work out. Initially, they remained very close to the water point they were released at and promptly appeared from the bush at 4:30 PM daily in the hope of their routine bottle of milk. Eventually they accepted milk was no longer a part of their diet and they started to range slightly more, exploring their new home. It did not take long for the only other black rhino in the 24,000 acres to sniff out that there was new rhino company to meet. Exactly seven days after the orphans were released, black rhino bull “Romeo” turned up at the release site water hole. An adult black rhino bull stands at close to 1.5 metres tall and weighs in at about 1,500 kilograms – so it is not surprising that three year old BeBrave decided that discretion was the better part of valor and departed the area, leaving Long Playing and Romeo alone to get to know each other. Within a month BeBrave and Long Playing were back together again with Romeo only making occasional visits to the area to keep in contact with his young neighbors. 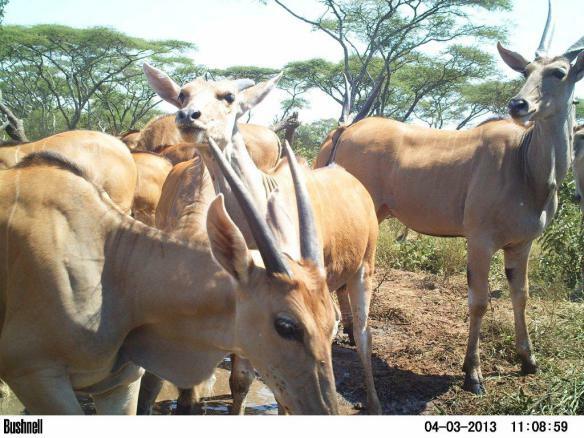 Sparky the eland had been hard to track down but given the large numbers of eland in the area it is likely he has just blended into the herds.